In the second free practice session for Sunday’s Canadian Grand Prix, Scuderia Ferrari continued a busy programme of evaluation of the latest updates fitted to the F14 T, which got underway this morning. In the second 90 minutes of the day, Fernando Alonso and Kimi Raikkonen split the work, the Finn trying parts the Spaniard had used in the morning and vice versa. Having solved the problems that had slowed him in the morning, Kimi set the fourth fastest time of 1.16.648 on the Supersofts, 53 thousandths quicker than Fernando who was fifth. Raikkonen completed 31 laps, Alonso 27. The Mercedes duo were quickest, with Lewis Hamilton posting a 1.16.118 and Nico Rosberg doing a 1.16.293. Sebastian Vettel was third for Red Bull in 1.16.573. Behind the Prancing Horse duo came Massa, Bottas and Magnussen. Like most teams, Scuderia Ferrari spent the final thirty minutes of the session working on a long run test, in preparation for the race. Here again, the two men split the workload, with Alonso starting off on the Supersoft tyres, while Raikkonen opted for the Soft, before switching to the softer compound at the end. As usual, Saturday’s programme features the third free practice session in the morning, with qualifying taking place in the afternoon. The Finn also suffered a spin after losing his Ferrari on the power at the exit of the hairpin while on super-softs, although this was after he had posted his quickest time. 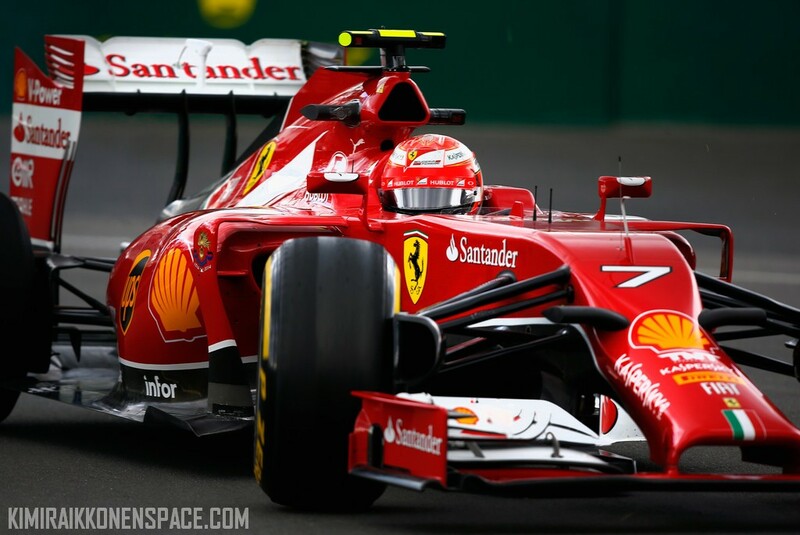 The first free practice session this Friday of the Canadian Grand Prix was a busy one for Scuderia Ferrari. There were various new parts to evaluate on the F14 Ts. Fernando Alonso was fastest in 1.17.238, while Kimi Raikkonen was ninth with a 1.18.578. Fernando had a trouble free session, covering 21 laps in his F14 T. Kimi Raikkonen had a glitch to deal with, unable to use the power unit to its full extent at the start of the session. The Finn completed 15 laps. So pleased to see our man doing progress and happy to hear that the team has reacted and giving support to Spagnolo. I’m sure he is good but not ready yet to handle such a big task. I don’t know how old David is but I guess he’s about Kimi’s age and experience so communication should be better and more straightforward. Its just unbelievable how the mainstream media treats kimi. Nobody has to endure more s**t than kimi has to do week in and week out. Jenson Button for example has achieved nothing in the last few years but never gets criticized, hamilton’s first year at mercedes was considered “a year of transition”. Alonso almost always gets the immunity card from critics. I admit that kimi has had a difficult start but the media has been radically bias towards him….maybe on a different level but I see vettel, a 4 time champ! btw, somtimes gets the same level of negativity..